Mystery, Maniac_of_Darkness, vectorman and 3 others likes this. What does this tool do? I'm not really up to date as to what's happening on the forums lately. This is a versioning and project management suite for GBA ROM hacking. Implied Backups -- You can "rewind" your project to any given patch. No more pointers to worry about! No need to worry about free-space -- if you don't reference an existing map in your own maps it won't be spared from overwriting at link / insertion time. Less prone to human error when tinkering in the ROM. Easier for tool-makers to write their tools to be ( if not immediately compatible with ) but easily extended to support any ROM with the proper data. Project resource management. Want to import a spritepack? No problem! Credits can even be managed. The gamecode_spec refers to the four-digit game-code of a ROM, and then if you have multiple versions matching that game code you also need to append a version number following it. eg BPRE0 or BPRE1. It's case-insensitive, I'm fairly certain. Your project name should only contain characters legal for a filename -- I have no bug-checks on this yet, so be careful! A project_scope looks like this: <<game_code>::><<version>::><project_name> all in one argument ( remember to quote if you don't want to escape your spaces ). Alternatively, you can leave out both game_code and version if you only have one project named "project_name". If you have two, one in BPRE and AXVE but only one on each version of the game you can specify only the game_code and leave out the version. If the only differing factor in your projects is version ( same game_code and project_name ) you only need to specify the project name and game_code. The only important things to remember are that you always need the project_name and the order of things needs to be maintained. -------/rom.gba <- This is the ROM you should edit. -------/project.json <- Don't touch this. It's important. -------/PROJECT_NAME(0.0.0).gba <- When using BuildRelease.exe, something like this will appear. It is up to you how you distribute this file ( patch / compression / etc ). I may change BuildRelease to generate a patch file that an imaginary "InstallRelease" program will handle in the future. In the nearish future, I plan to create a file-watching service that will automatically detect changes, generate patches, and store them. Not sure how all of this will work on Linux. ** Also, please know ahead of time that all of these programs run really slow. They're not optimized at all. 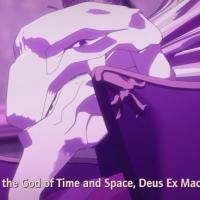 I am Deus, the God of Time and Space! Deus updated his profile photo.